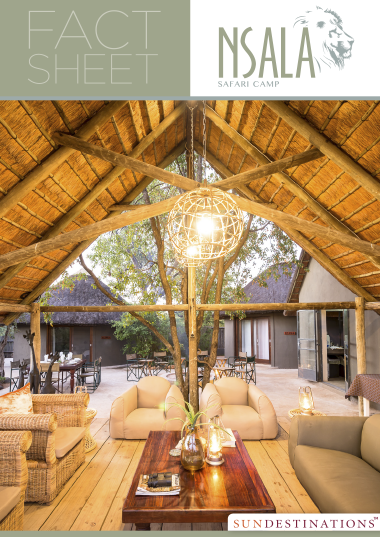 An intimate and rustic bush camp perched on the banks of a dry riverbed in the Nsala Private Game Reserve bordering the Timbavati and Klaserie Private Nature Reserves. 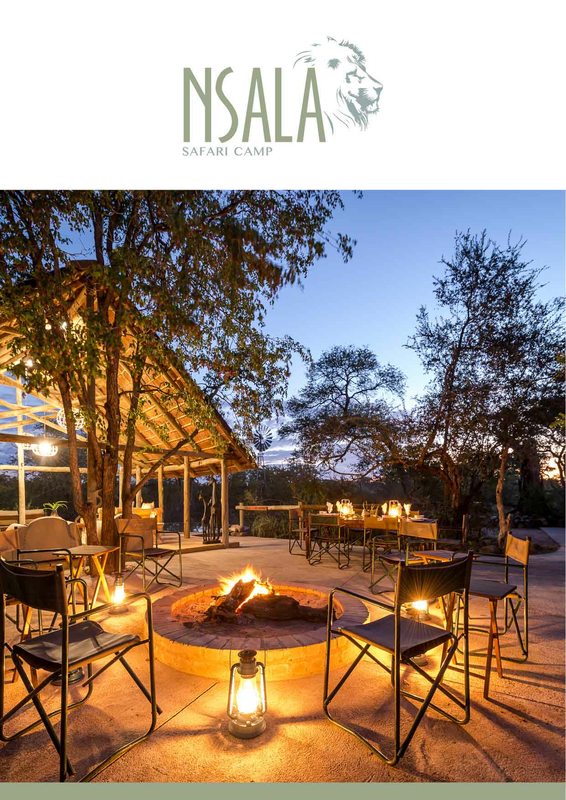 Nsala Safari Camp is located in a game-rich private game reserve sharing unfenced borders with the world-renowned Timbavati Private Nature Reserve, the Klaserie Private Nature Reserve and the popular Kruger National Park. 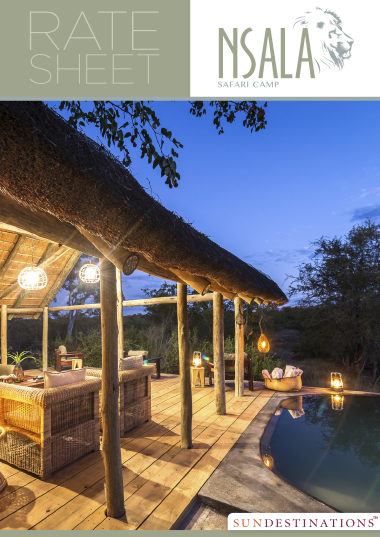 Nsala is an intimate and rustic bush camp hugged by marula and leadwood trees, and is perched on the banks of a dry riverbed overlooking a gentle s-bend in the meandering river. The design of the camp is simple in its structure and offers all the charm of a bygone era while not compromising on modern comforts. Nsala maintains a standard of comfortable luxury while simultaneously offering a completely eco-aware, off the grid experience for those seeking a safari that reduces their carbon footprint. The camp sits on an elevated area guarded by a high-reaching thatched roof. 3 chalets flow out from the main section housing a swimming pool, lounge/dining area, and boma. Each of the chalets is fully-enclosed and has a wooden glass sliding door. The 5000 hectare traverse comprises mixed mopane bushveld, bushwillow and low-lying shrubbery typical of the Kruger savannah. Dry riverbeds shrouded in vegetation cut through the terrain, and provide the perfect hideaway for leopards and other predators to den their young. Nsala offers an unrivalled game viewing experience in a concession considered a sanctuary for wildlife, and is also home to the big 5. The camp is located about 60 km drive from Hoedspruit/Eastgate Airport and is an easy self-drive from Johannesburg. 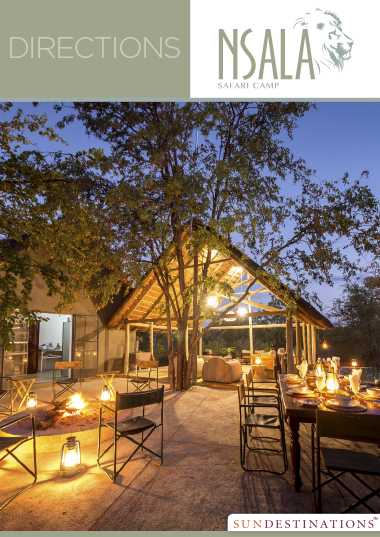 Guests access the camp via the Timbavati/Klaserie (Enkhulu Gate) Gate. There are 3 options for getting to camp : Self-drive, scheduled road transfer from O.R Tambo and flying directly into Hoedspruit Airport from one of the major South African International airports.